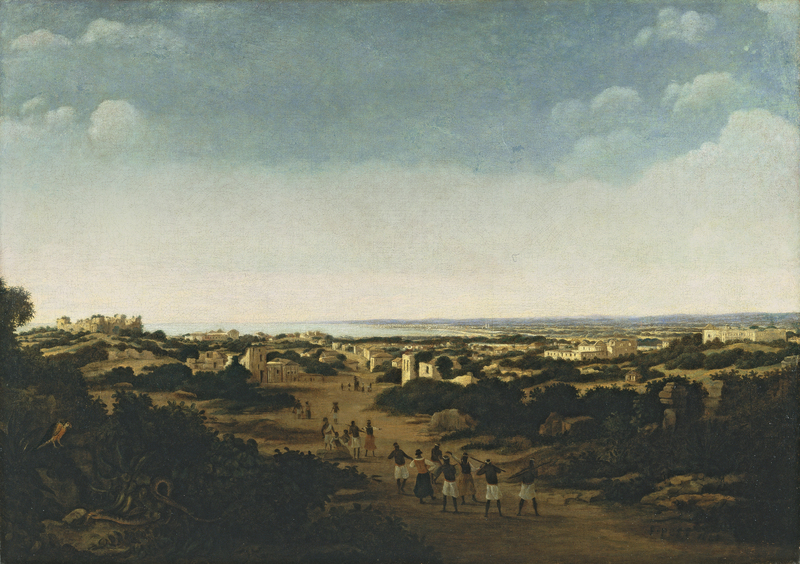 Frans Post went to Brazil as part of the expedition organised by John Maurice of Nassau-Siegen, embarking on 25 October 1636 and arriving in Recife in 1637. Among the retinue of the Prince, who had been appointed governor of the Dutch colony, were merchants, military figures and scientists while in addition to Post, the expedition also included the animal and figure painter Albert Eckhout. The mission’s aim was to establish an area in Brazil where the Dutch East India Company could safely operate. While the principal reason for this endeavour was commercial, John Maurice of Nassau also considered the expedition to have a scientific facet and intended to study the topography, flora and fauna of the country. During the years that Post spent in the New World (he returned to Holland in 1644) he painted various views and made numerous sketches of the land and the surrounding area. Of the paintings that he made in situ, only six have survived, almost all of which are in the Musée du Louvre. These canvases are totally innovative within Dutch landscape painting and are characterised by the simplicity and ingenuity with which the painter depicted these new and unknown views. Following his return to Holland, Post would focus on similar views of exotic setting. Basing himself on the sketches that he made on this trip, he specialised in views of the East Indies that gradually lost their topographical rigour over the years. He increasingly emphasised the most exotic elements of the flora and fauna, while his use of colour became more saturated and different to that used in his earliest compositions of this type. Using a high viewpoint, in the present panel Post depicts a broad plain that extends on the right to the horizon where we see a large bay. The view represents the Portuguese settlement of Olinda, which had been destroyed by the Dutch in 1631 and of which the overgrown ruins of the buildings survived as witness to the destruction. Post used the centre of the canvas and the foreground areas to depict a dusty road with buildings on either side leading the eye to the sea. On the road he included various groups of native people. Three further versions are known of this composition, two of them with an inscription that has allowed the subject to be identified. The third (location unknown) does not have this important detail, nor does the present canvas. The buildings depicted such as the Carmelite and Franciscan convents, the Jesuit college, the basilica, and the governor’s residence in the background are all to be found in a print by Caspar van Baerle published in Amsterdam in 1647. It would seem that a painting by Post recorded in the French royal collections and referred to in an article by Robert C. Smith of 1938 may have been the prototype for the versions of this composition that are now known. Post introduced exotic details such as a huge snake and a bird at the lower left corner.